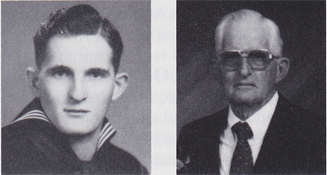 William I. H. McComas, Electrician's Mate 2/c, born Aug. 1, 1917, Verden, OK, graduated high school and joined the USN on July 10, 1936. He was stationed at NTS San Diego; aboard the USS West Virginia; USS Arogone; and San Diego Destroyer Base. Discharged July 20, 1940, with the rank of EM2/c. Married and has two children, five grandchildren and eight great-grandchildren. Employment: electrical supervisor at Lockheed and farming.